The history of rock music is a tangled web of innovation and influence, and its with this in mind that Milanese artist Alberto Antoniazzi has created the ‘Rock N’ Roll’ map, plotting the lay of the land for histories hit makers. 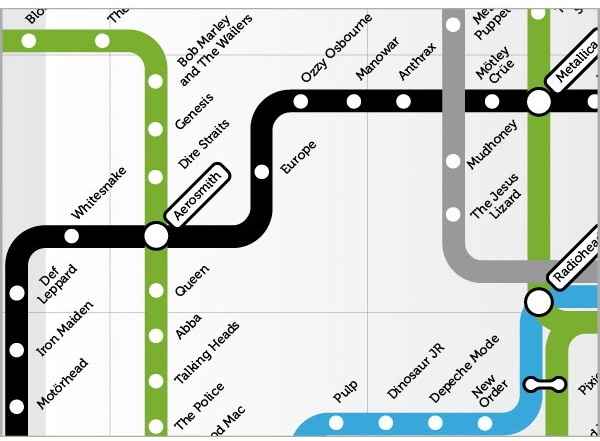 The map, which takes its graphic inspiration from metropolitan transit mapping, presents a wide variety of bands in a clean and visually stimulating manner. Covering a range of groups from Metallica to ABBA, Antoniazza’s ‘Rock N’ Roll’ map uses great design to tackle this diversity of musical history. Is there a link to the full map ? where can i buy this map? itd make a sick poster. Hey, great idea! is it just a concept or I can buy it somewhere? This guy is a cool designer but doesn’t know sh*t about music. OW! All night! Yeah Motley Crue is closer to Metallica than Motorhead? Unfortunately, this is just a concept. Sorry! These are the only images posted by the artist at this moment!